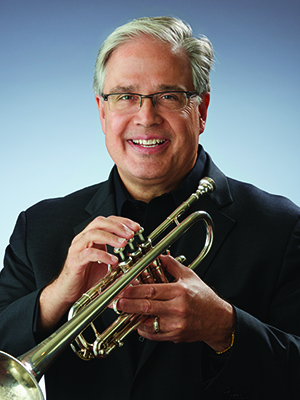 Robert Wood joined the trumpet section of the Indianapolis Symphony Orchestra on a full-time basis in 1992 after many years as an extra musician. Born in Decatur, Illinois, he grew up in Lafayette and holds a B.A. from Butler University. His major teachers have included William Adam and former ISO trumpets Michael Farrow and Delbert Dale. He has also performed with the Houston Ballet and the Miami Chamber Symphony as well as many live concerts with the top names in popular music. Wood is adjunct instructor of trumpet at the University of Indianapolis and held a similar position at Butler University for 21 years. He is remembered for his portrayal of Bix Biederbecke in the Indiana Repertory Theatre’s 1980 building-opening run of Hoagy, Bix and Wolfgang Beethoven Bunkhaus, a performance that earned him national praise. As president of Wood & Rodin, Inc. he administers recording sessions for music publishers as well as national artists. He has appeared as soloist with the Orchestra and local chamber music ensembles, served as section coach for the ISO’s Side by Side program and is a member of the ISO Brass Quintet. Wood and his wife are the parents of one son.